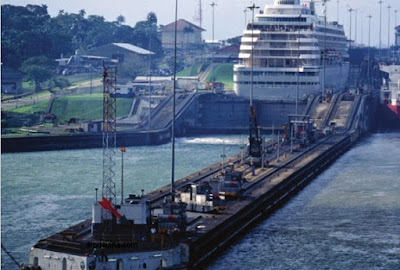 History of The Panama Canal in Central America - The panama canal creates one of the longest shortcuts in the world. Before it was built, ships going from the Atlantic Ocean to the Pasific Ocean had to sail around South America. The new canal made it possible to cut through Panama, a country at the southern end of North America. This took about eight thousand miles (thirteen thousand kilometers) off the journey. It is such a useful route that thousands of cargo, military, and cruise ships travel through the canal each year. People had dreamed of connecting the oceans as far back as the 1500s. It would be centuries, though, before the proper machinery and know-how made a canal possible. In the late 1800s, a canal seemed achievable. The French were the first to try. However, their machines were too small, and tropical diseases killed many workers. By the end of the century, they had given up. The dream did not die, though. United States president Theodore Roosevelt saw how valuable a canal would be for moving goods and people. Furthermore, he was convinced a canal was essential to the defense of the United States. It would allow the American Navy's fleet of ships to move quickly from one side of the country to the other. In 1903, the United States goverment paid Panama $10 million for the right to build and operate a canal there. The first task was to make the area safe for workers. Crews cleared brush and drained swamps, killing millions of disease-carrying mosquitoes that had devastated the French attempt. Soon steam shovels were digging through the hills on the Pacific side of Panama. The earth here was very loose, and landslides slowed the work. It took several years to make a cut 8 miles (13 kilometers) long. During that time, tons of earth were removed to make a channel called the Gaillard Cut. The earth taken from the Gaillard Cut was hauled by train to the other side of the country. There it was used to make a dam across the Chagres River. Once finished, the dam backed water into a valley to create Gatun Lake. Gatun Lake and the Gaillard Cut would form the main waters of the Panama Canal. Yet both lay above ocean waters. Therefore, ships would have to be raised and lowered to use the canal. This required structures called locks. A lock is a giant tank used to move ships between two levels of water. A vessel moves into a lock, and the gates of the lock are closed. Water is poured into the chamber or drained out until the level inside the lock is the same as on the other side of the water that the ship is moving toward. Then the gate opens, and the ship sails out. The locks of the Panama Canal were one of the biggest engineering challenges of the project. They were built in pairs to allow vessels to travel both ways on the canal at the same time. At 110 feet (34 meters) wide and 1000 feet (305 meters) long, they were the largest concrete structures ever built. The steel gates for the locks were also massive. Each one weighed more than 700 tons (635 metric tons). They were opened and closed with a 40-horsepower engine. This is the same size motor used to power a small boat. A vessel coming from the Atlantic Ocean is hooked to locomotives that guide it through the Gatun Locks. These locks raise the ship 85 feet (26 meters) to Gatun Lake. During the busiest construction period, almost forty-five thousand people were working on the Panama Canal. Most came from the British West Indies, but many were from the United States. The Panama Canal was completed in 1914 at a cost of $352 million. Another kind of cost was the number of deaths. Over five thousand people died from injury of illness while working to complete the canal. On August 15, 1914, the first ship, the SS Ancon, sailed through the Panama Canal. Its journey was much the same as the trip is today. A vessel coming from the Atlantic Ocean is hooked to locomotives that guide it through the Gatun Locks. These locks raise the ship 85 feet (26 meters) to Gatun Lake. After a 32-mile (51-kilometer) journey across the lake, the ship sails through the Gaillard Cut. At the end of the cut, it enters the Pedro Miguel Locks. These lower the ship 30 feet (9 meters) to another lake. From here it moves through the Miraflores Locks and is let down another 52 feet (16 meters) to the Pasific Ocean. The 50-mile (80-kilometer) trip takes about eight hours. The locks by the Pacific Ocean lower ships three feet more than the Atlantic Ocean locks. This is because the sea level here is three feet lower. In 1977, the United States agreed to gradually transfer ownership of the canal to Panama. The transition was complete at the end of 1999. Since then, Panama has improved the canal by widening the Gaillard Cut and improving the locks. With these changes, the hope is that canal will be used for many years to come.